This article is about the island fortresses in Denmark. 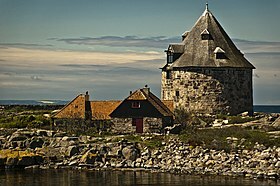 For the fortress in Norway, see Christiansø Fortress. Parishes numbered. Ertholmene is the parish mentioned with the number "1" in the upper right hand corner. Ertholmene (formerly spelled Ærtholme(ne) and generally known as Christiansø) is a small archipelago situated 19 kilometres (12 mi) northeast of Gudhjem, Bornholm and 27 kilometres (17 mi) east of Allinge-Sandvig in the Baltic Sea. It is 106 miles (171 km) southeast of the capital of Denmark, Copenhagen. Its name derives from the Danish for "pea islands". 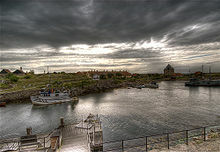 Ertholmene belongs to Denmark and has the country's easternmost point. Its permanent population was 83 people in 2018, and its area is 39 hectares (0.39 km2) (0.16 sq mi). Together with Bornholm it is part of Landsdel Bornholm. Ertholmene makes up the Parish of Christiansø in the Church of Denmark and is served by Christiansø Church. On 1 January 2017 out of 78 inhabitants in total there were 69 members of the Church of Denmark (88.46% of the population). Ertholmene has never been part of a municipality, county, or region. The islands are administered by the Ministry of Defence. Ertholmene consists of three main islands, Christiansø (named after King Christian V), Frederiksø (named after King Frederick IV) and Græsholm, plus a number of minor rocks and skerries, including Tat and Østerskær, Denmark's easternmost point. Christiansø makes up 22.3 hectares (0.0861 sq mi), Frederiksø 4 (0.01544 sq mi), and Græsholm 11 hectares (0.04247 sq mi). Only Christiansø and Frederiksø are inhabited, while Græsholm is a bird reserve. The sound between Christiansø and Frederiksø, a well-sheltered natural harbour, is crossed by a pedestrian bridge that can be pulled aside to accommodate larger vessels. Fishermen from Bornholm have used Ertholmene for temporary shelter since the Middle Ages. The first permanent settlement was the result of the Danish-Swedish conflicts in the late 17th century. As Denmark needed a naval base in the central Baltic Sea, a fort was built on Christiansø and Frederiksø in 1684 which served as an outpost for the Danish Navy until 1855. Christiansø Church originally served the garrison. The population peaked at the census in 1810 which showed 829 inhabitants. They were soldiers and were there because of the Gunboat War. Many of the historical buildings now serve as living quarters for the local population, and some are rented, year after year, to regular summer residents. The islands' external appearance has changed very little in over 300 years. Girdled by thick granite walls with old cannons pointed seaward, Christiansø is a picturesque tourist spot seemingly frozen in time. A former part of the fort, Store Tårn has housed the Christiansø Lighthouse for the past 200 years, and a small round tower on Frederiksø, Lille Tårn, serves as a museum. The islands form an unincorporated area that does not belong to either a municipality or a region. Instead they are state property governed by an administrator, appointed by the Danish ministry of defence, with the responsibility being the tasks normally performed by municipalities and other public sector civil services. The major sources of income are fishery and tourism. There are 80,000 tourists per year, mostly day visitors arriving via Bornholm. Ertholmene is also a popular destination for yachts. The islanders, who do not pay municipal taxes of any kind and were never part of a municipality, were exempt from the central government "Health Contribution" tax (Sundhedsbidrag) which stood at 8% when it was introduced on 1 January 2007 with Kommunalreformen ("The Municipal Reform" of 2007), because it was thought that the relatively isolated islets would otherwise be abandoned. This tax replaced the county tax, which the islanders were also exempt from paying, not being part of a county. From 1 January 2019 this tax has been abolished, while income taxes in the lowest bracket have been raised simultaneously instead with this tax being phased out. From 2012, the tax was lowered by one percentage point per year. ^ "Ertholmene". Ramsar Sites Information Service. Retrieved 25 April 2018.